Not a great qualifying lap imho and was much better during Sunday's race. Especially in Turn 12. Am getting more concerned about posting videos online due to the competitive nature of the sport. So this might be my last video posted on the site, though Enjoy the Track sponsors will have access to a special section with new videos. If you are interested in joining our team, please e-mail us by clicking here. A fairly good lap around this track in the chicane/chicane configuration. A fairly good lap around this historic track. A few interesting moments during qualification at Friday's NARRC finals. 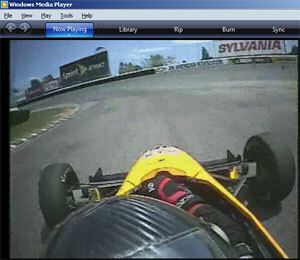 A lap around the track in a larger format screen size. The full race video is enabling me to see where lap times can be reduced. A couple of laps with loose camera mount gives some interesting perspectives. Note the quantity of water around the front left tire! Below are a few videos from Driver Education (DE) days in the tintop for your enjoyment. While these may not be my best laps, they should provide useful -- or humorous information depending on one's point of view -- of various tracks and the racing line. The Glen is a fast track with little run off area in some sections and near parking lots runoff in others. Note the very high blue Armco that surrounds certain parts of the track while watching the video. 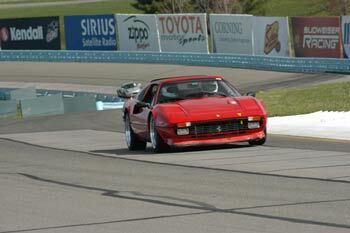 Fans of Formula 1 will remember Watkins Glen from the 'good ol days.' Tires were Michelin Pilot Sport PS2 as the weather was variable. My sarcastic thanks goes out to the BMW Club who, the day before this event, left a wonderful trail of oil on the racing line going into the laces of the boot that went all the way to the lefthander. That oil took its toll on a few cars quite badly. 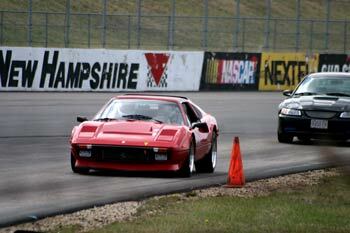 As luck would have it, the 308GTS QV suffered only a minor side swipe into the tire wall at the bottom of the hill. Nothing major that some tape and a about an ounce of touch-up paint could not fix. 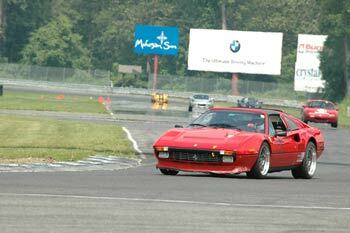 This was during the Ferrari Historic days sponsored by the Ferrari Club Of America (FCA). Once again the weather was variable so was using Michelin Pilot Sport PS2 tires. Perhaps variable is a kind word, as a torrential downpour ensued during one of the event days and found myself alone on the track! Maybe only the crazies are willing to tackle the very slippery LRP in torrential rain conditions. My full wets (Mich Pilot PS2) did quite well as i added some pressure and softened up the suspension. There is some good run off area in many spots, so if you dare you can experiment with the limits in many sections. Just beware of the uphill and taking the downhill too fast, as being caught out can spell disaster! Finally a dry day! NHIS is a very tight and technical track with an unforgiving personality. There is virtually no good place to have an off. None! Whilst going wide at turn three (the uphill) is usually where metal hits the concrete backed tire barrier (ask me how i know! ), other spots like the bowl has seen many cars just sweep right off and, in turn, head straight for the brutally uneven dirt followed by the familiar tire barrier. Have never been there myself, yet have seen many cars suffer that fate. Unlike Watkins Glen, where you can easily achieve speeds over 140 mph, NHIS is about mechanical grip and 'point and shoot' driving. Forget about top speed and note the traction circle as the modified Ferrari 308GTS QV handles well over 1G during many of the turns. Due to dry conditions, the tires were Michelin Pilot Cup. NOTE: Ferrari 308's are known to have rear stub axle problems so ensure your rear stubs are checked before using very grippy Hoosier rubber. No content within this Web site may be copied or reproduced without permission.